Glitzy and glamorous, Florim USA Glitz glass mosaic tile has plenty of pizzazz that can transform the plain and simple into something that is truly impressive. These stunning tiles are available in six distinctive color groupings. If you’re looking for something fun and friendly, the Metal Leaf Sun or Gold patterns are ideal. 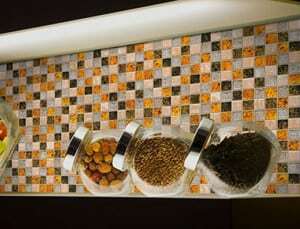 They create a fun backsplash or floor covering that will liven up even the most drab kitchens or bathrooms. If you’re looking for something more eclectic and vibrant, consider the Pinwheel Amber or Tortoise patterns. These feature both square and rectangular tiles of yellow, brown, white, and blue that are arranged to create subtle patterns within the pattern. If you’re searching for something with a distinctly modern appearance, the Stix collections are perfect options. Each feature the perfect combination of narrow tiles in black, grey, and white. They are ideal for visually elongating smaller counters and making narrow spaces feel considerably taller. We invite you to contact us at Conestoga Tile today for more information about Florim USA Glitz mosaic tile. We will be glad to answer your questions and help you find the best tile for your home.